What triggered me to write this webpage? I am an ex-sufferer of bed bugs from around Dec 2008 to Dec 2009 and I know exactly how you feel if you are a victim of this creature bedbug-> BB. I couldn't sleep well for more than solid 12 months! And belive me, its really a terrible and demoralised feeling. Almost went into depression as I can't go around telling friends my home has BBs and at the same time telling them not to come. Waking up at ~1am to 3am to check for bedbugs every morning before going for work, tired and fearful about the next morning. Threw away furnitures and bought steam cleaner, spraying insecticides, expensive lotions and powders. Nothing worked at all. I 've went to homes of friends and foreigners, noticed there still are many unaware of this BB problem. Not surprising to me, as I also didn't knew abt BB until I got it. This BB problem surfaced mainly due to increase of human traffic. Hence, I decided to set up this webpage to assist victimes of BBs to make an informed decision on managing & getting rid of BBs. Hope this help you to settle your problem fast. How do we know if our homes, work place are invaded by bed bugs? They usually hide near your sleeping area or hard to find places like seams of your bed or bags. There will be black stains left by the BBs (stools/feces). Most of the time, you will be itchy. Sometimes will be depressed after not sleeping well. 1. Hiding near seams of bed or bag. If you are new or unsure about bed bugs (bb). 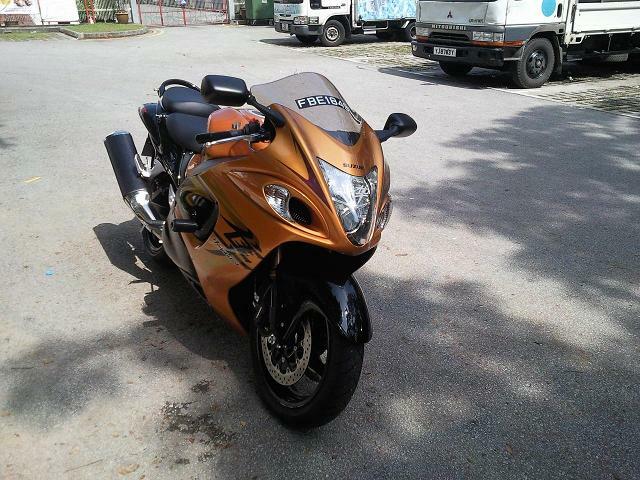 This is exactly how a bb will look like, pls see above & right picture. Bedbugs (or bed bugs) are small, elusive, parasitic insects of the family Cimicidae. They live strictly by feeding on the blood of humans and other warm-blooded animals. The name 'bed bug' is derived from the insect's preferred habitat infesting houses and especially beds or other common areas where people may sleep. 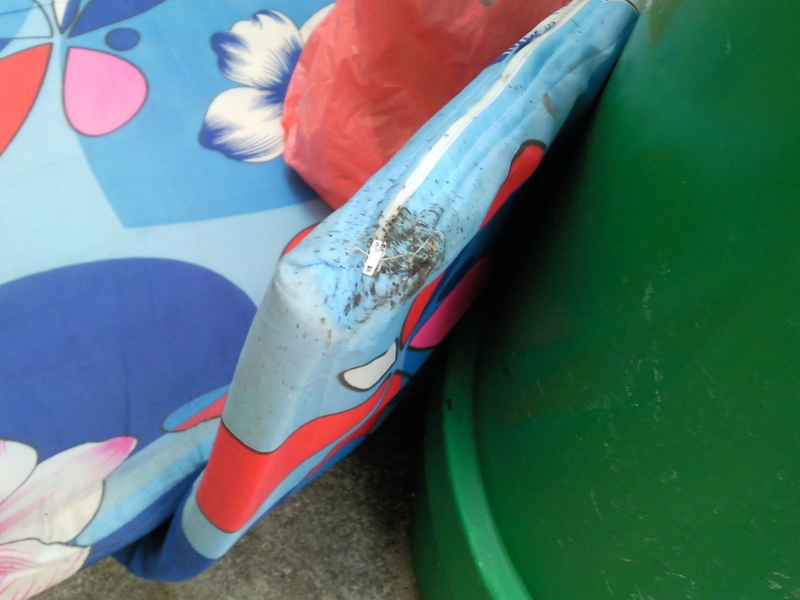 The common bedbug (Cimex lectularius) is the species best adapted to human environments. It is found in temperate climates throughout the world and feeds on blood. Other species include Cimex hemipterus, found in tropical regions, which also infests poultry and bats, and Leptocimex boueti, found in the tropics of West Africa and South America, which infests bats and humans. Cimex pilosellus and Cimex pipistrella primarily infest bats, while Haematosiphon inodora, a species of North America, primarily infests poultry. 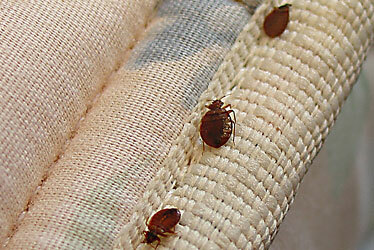 Adult bedbugs are reddish-brown, flattened, oval, and wingless. Bedbugs have microscopic hairs that give them a banded appearance. A common misconception is that they are not visible to the naked eye. Adults grow to 4–5 mm in length and 1.5–3 mm wide. They do not move quickly enough to escape the notice of an observer. 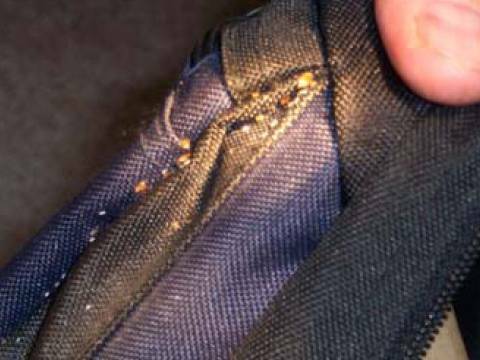 Bedbugs are bloodsucking insects. They are normally out at night just before dawn, with a peak feeding period of about an hour before sunrise. 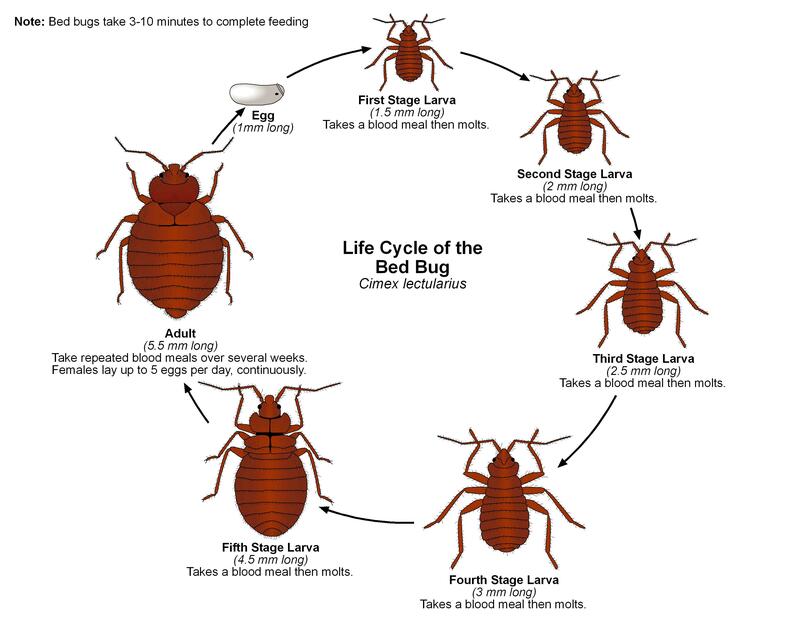 Bedbugs may attempt to feed at other times if given the opportunity and have been observed feeding during all periods of the day. They reach their host by walking, or sometimes climb the walls to the ceiling and drop down on feeling a heat wave. Bedbugs are attracted to their hosts by warmth and the presence of carbon dioxide. The bug pierces the skin of its host with two hollow feeding tubes. With one tube it injects its saliva, which contains anticoagulants and anesthetics, while with the other it withdraws the blood of its host. After feeding for about five minutes, the bug returns to its hiding place. The bites cannot usually be felt until some minutes or hours later, as a dermatological reaction to the injected agents, and the first indication of a bite usually comes from the desire to scratch the bite site. 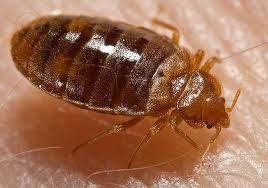 Because of their natural aversion for sunlight, bedbugs come out at night. Cimex lectularius, showing the insect’s skin-piercing mouthparts. I have personally tried almost all means of suggestions that can be found in books and the internet. Nothing seem to work. For one whole year, I have been suffering from sleeplessness due to waking up at 1-3am to check for BBs using torchlight and squashing them with tissue paper. These does NOT seem to work on BBs effectively !!! WHAT REALLY WORKS AGAINST BED BUGS? Can you guess what works against bed bugs then? Before you find out the answers, pls also read the disclaimer and information presented here before trying out this method that works in my case. This solution is strictly NOT meant for people with health problems or allergies to chemical. Only try this solution when you have no way out. The most effective solution against bed bugs is none other than THINNER! I am not joking, thinner really works on killing bed bugs. 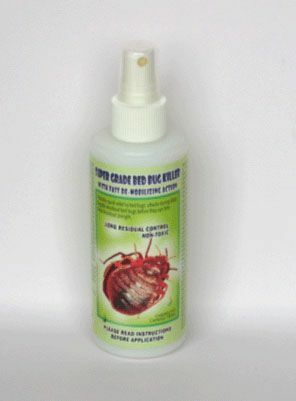 Test it on any bed bugs and you can see them 'melting' away. We discovered the use thinner by chance when my dad dripped some drops of thinners onto his working bag where the bed bugs are hiding, they died immediately. We reckon its the corrosive nature of thinner that can dissolve the 'armoured' bodies of bed bugs and the smell of thinner is also quite strong for the bedbug. 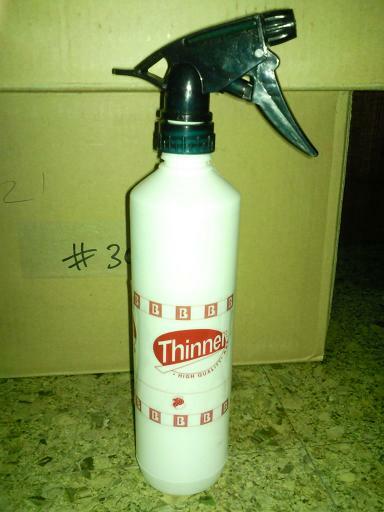 Thankfully, using this method of spraying thinners you will see results within 3 to 5 days. The bed bugs will no longer able to survive in any of your rooms. We only spray around the suspected areas like bed seams, floor, etc. The bed bugs will be gone in a short time. Even though you have to bear & endure with the smell of thinner, its still worth the effort as compared to using insecticides and other expensive methods that may / may not work. Save time and money $ ! After you have solved your BB problem, try your best to avoid going to homes that are have this problems. You know what I mean? Avoid places where there are many people staying in the home. Check the home before you decide to stay long at the home, especially look out for any crawling insects & back stains on sofas, floor & walls. Pls read the below notes before you begin using thinner. Do not spray thinner onto your painted walls as thinner can strip off your wall paint. Avoid spraying thinner onto your electronic devices like radio, clocks, mobile phones, pc, laptop etc. Your electronic devices will be damaged if you choose to spray thinner on them. Bear in mind that you have to wear hand-gloves and personal protective gears such as mouth mask, goggles/spectaces to prevent fainting, vomiting, fluid getting into the eyes and any uncomfort that may arise. Also be mindful that thinner is flammable and can cause fire if not use properly or when there are fire sparks around. For safety reasons, do not light any fire when using thinner. Pls do not spray thinner when your children, pets or any living things are around or when you are about to sleep. The smell of thinner will usually be evaporated within half an hour if the room is well ventilated. The webmaster of this webpage must not be held responsibe for any problems that may arise from using thinner. The use of thinner will be done at your own risk. Those of you with health risks should consult your doctor before doing so. If you are left with no choice, you can also engage a reliable local pest-buster to do the job. 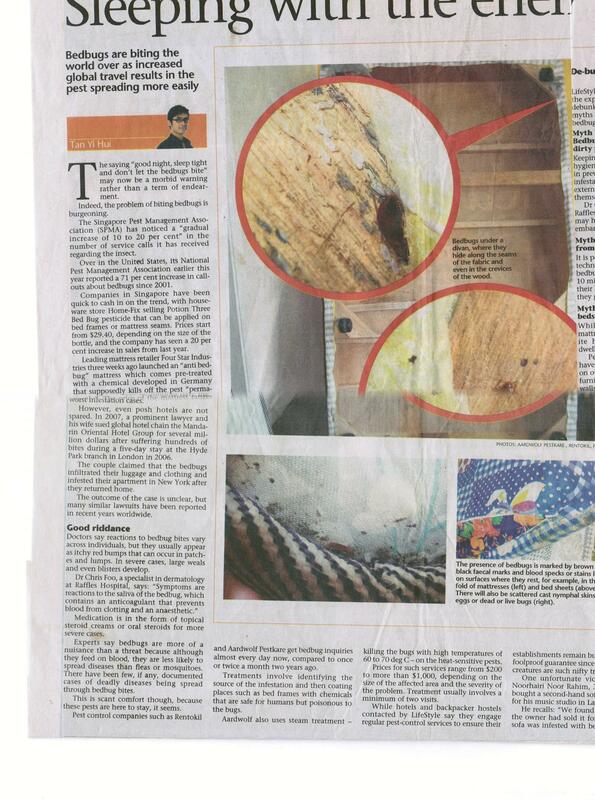 Costs of fumigation should be around SGD$300-$400, job turn-around time=7 to 10 days. The price should also include 2 rounds of fumigations. Guarantee period is after they come for the second fumigation. Pls liase with your pest busters. 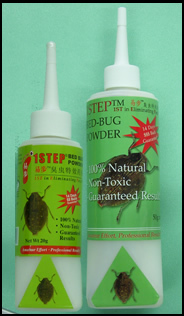 The above recommendation of using thinner against bedbugs is based on the positive outcome/results that arised from the experience of the webmasters' long battle against bedbugs which happened from period Dec 2008 to Dec 2009 (~1 year). 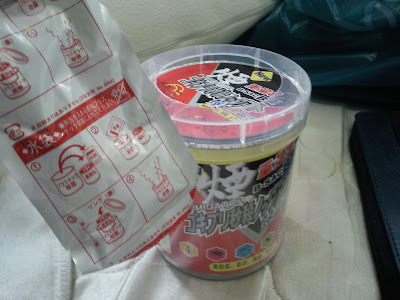 I do not recommand any particular brand of thinner, the picture below is for illustration only. Its up to you to choose your brand of thinner but don't buy the cheap type which smell very strong & badly. Buy the more costly one should not cost you more than $7 per bottle , picture as below.